A powerful film that details an important historical event (though here in a fictionalised story) - that of the Vel d'Hiv round up - the capture and deportment of Jews by the French and their later encampment and murder. The story told through the eyes of Sarah - a young girl who... read morese family is captured and whose brother she attempts to save by locking him in a secret cupboard in their apartment - is powerful, shocking and moving. At the same time, in modern day France, Kristin Scott Thomas gives a typically stunning performance as Julia, a journalist investigating the events of 1942 who discovers the apartment that her husband wants to move into was once lived in by Sarah and her family. As her personal life begins to take an unexpected turn, she becomes more involved with finding out what happened to Sarah, her brother, and her relatives. For the first two thirds, Sarah's Kery barely puts a foot wrong. The film is never sensationalist but pucks a mighty punch, with some truly distressing but necessary sequences as we learn more about Sarah's life whilst also finding how this fits in with Julia's investigations. It really is brilliant stuff. Alas, the final third, though still very watchable, loses grip somewhat and becomes more about Julia's journey, which it has to be said, is beyond mild compared to Sarah's story, and neither the compelling performances or solid direction quite re-capture anything close to the opening 70 minutes. 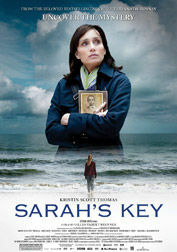 Still, Sarah's Key is a unique and poignant film and the final line will leave not a dry eye in the house. Having read the book, I was somewhat hesitant to watch Sarah's Key but I was not in the least disappointed, in fact, I thought it was an excellent adaptation. Kristen Scott Thomas gives a stellar performance as an American journalist who lives in Paris and is assigned to write a... read more story about the French roundup of the Jews in the 1940's. As she investigates the past of a French Jewish Family, she becomes obsessed with finding and exposing the truth as others, including her own husband judge her in complacent ignorance. As she delves further into the horrors this Jewish family was subjected to, she discovers a terrible secret which involves her family. Melusine Mayance is superb as Sarah, the brave little girl who not understanding the scope of the situation locks her brother in the closet to save him and ends up being his executor. The decision she made affects her for life. The story is heart wrenching but grabs you right from the beginning. It is told in past and present until the two converge into a possible bright future.